Global Sports brand PUMA links up once again with New York’s own, Jeff Staple and his brand Staple; for another collaborative season. Whatever is the opposite of routine, that’s what Jeff Staple is into. A design tour de force, entrepreneur, and self-professed sneakerhead, Staple’s energy is relentless. He has his hands in just about everything: graphic design, web design, clothing design, music and writing. The latest PUMA NTRVL Collection includes men’s and women’s ranges that gives the traditional a solid twist of fashion-fitness. Designs adapt to every moment in the day with multifunctional constructions and details, premium materials, and performance tech. NTRVL will take you from work, to a workout mesh, then to casual evening out — all seamlessly. NTRVL is made to make your routine — un-routine. The idea behind this season’s collection is to have a piece for every interval of the day. This is apparent in the styles that were chosen. 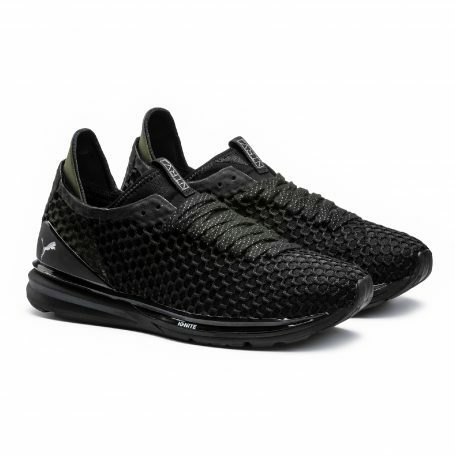 The footwear consists of two of PUMA’s brand new silhouettes, the Limitless NETFIT and the Suede IGNITE. The Limitless NETFIT takes technology and design to the next level. Energy-returning IGNITE FOAM, a customizable NETFIT lacing system, and reflective details turn it into a streetwear essential by Jeff Staple. The Suede IGNITE may look like it’s archive relative, but this style has a whole new ride and feel to it. Decked out in with a full IGNITE midsole, maximizing comfort and energy return. The color-blocking upper is made up of a rich nubuck, with reflective accents throughout. The NTRVL concept takes perfect form with a design that adapts to a life lived on the go. A prime example would be the Jackpack. The water-repellent nylon fabric is accented by engineered tape. The padded vest is fully detachable. The elasticated tape that is the real threat through the range is applied to the back of the jacket with contrasted knit structure and ensures and enhances freedom of movement while working out or an advanced look while wearing the jacket on the way to the office. The outerwear also stays true to this NTRVL idea. The reversible jacket is true performance outerwear and the perfect companion for cold winter workouts. The combination of the printed woven water repellent fabric together with a two-layer bonded interior ensure enhanced movement. The jacket can be worn on both sides and is down filled which makes it a premium outerwear piece for cold weather. Every piece in the collection has been elevated with the NTVRL concept. From premium materials like PUMA’s EvoKNIT technology on the apparel, to function forward specs like PUMA’s new NETFIT technology on the footwear. Every person will go through different phases and intervals in their day and lifetime, this is a collection curated to that belief. Drop one of the AW17 PUMA NTRVL Collection releases on August 5th while the second drop goes in-stores on November 18th. Available on PUMA.com, PUMA stores, Staplepigeon.com and leading sneaker retailers worldwide.